Hospice is a place for an individual who is at the end of their life and requires care. The Hospice will be a place where physical, emotional, social and spiritual care is offered to clients and families in a home-like environment. The standalone Hospice will provide care for individuals who do not require the services of an Acute Care Hospital and are no longer able, for whatever reason, to stay in their home. HOW WOULD HOSPICE DIFFER FROM HOSPITAL CARE? The Hospice will provide a place that is home-like and as non-institutional as possible: a peaceful environment that will respect clients and family wishes. The care will be coordinated by healthcare professionals who consult with the Palliative Care Resource team, family physicians and other agencies and services as needed. 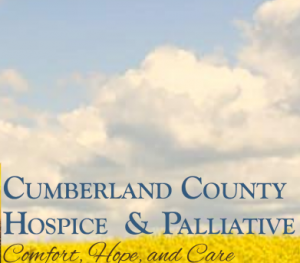 WHY DOES CUMBERLAND COUNTY NEED A HOSPICE? Unlike other counties in this province, Cumberland County does not have a Hospice Facility supported by the Nova Scotia Dept. of Health and Wellness. The CCHPCS’s goal is to change this and offer our citizens another option of care. WHERE IS THE HOSPICE TO BE LOCATED? The Hospice would be situated on a 15 acre parcel of land located in West Amherst (on West Victoria Street). It is within the boundaries of the town of Amherst which has water, sewer and fire protection. WHO IS DEVELOPING THE HOSPICE? The development of this standalone Hospice is a project of the Cumberland County Hospice/Palliative Care Society. Currently there are hundreds of Society members who support this project and a Board of Directors and number of teams are working toward this goal. These members are located in all areas of Cumberland County. WHAT IS THE SCHEDULE FOR THE DEVELOPMENT AND BUILDING OF THE CUMBERLAND COUNTY HOSPICE? The CCHPCS has completed the Design Phase of the project and the architectural design can be seen at the CCHPCS Office at the Amherst Center Mall. Currently the CCHPCS Board of Directors is aiming to begin the Capital Campaign to raise $4.2 million dollars for this project in the near future. This money includes the cost of the facility plus two years of operating costs. WHO WILL MANAGE THE HOSPICE? The Hospice will be operated by the Cumberland County Hospice/Palliative Care Society who will employ healthcare professionals who specialize in Palliative Care Service Delivery. 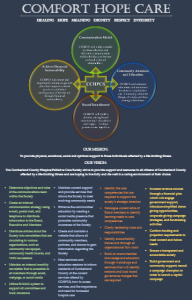 The CCHPCS is a volunteer organization that was incorporated in 2002 and is a Registered Charitable Society. HOW DO I GET INFORMATION ABOUT THIS PROJECT AND HOSPICE CARE?